My friend had suggested this restaurant to me several times and we finally decided to go. Located across from Square Phillips and across from The Bay, it was an extremely easy location to get to. 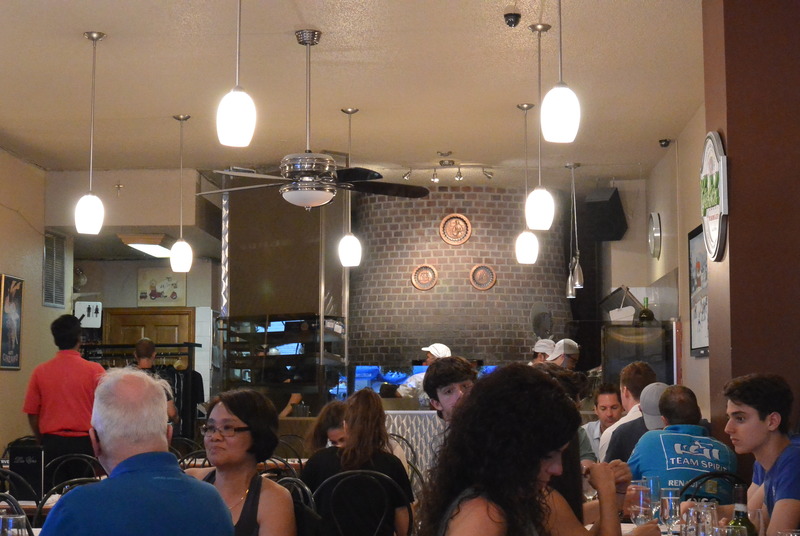 I had never thought much about this busy restaurant even though I’d passed by it numerous times… The wood oven could be seen in the back with 3 chefs making the pizzas. Each pizza is done fresh within a very reasonable time (I’d guess around 10 minutes, our pizzas were served after we ordered). 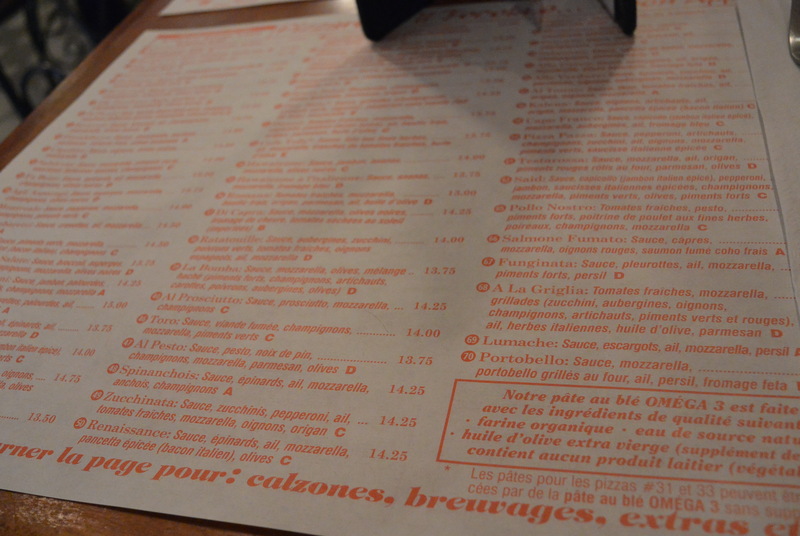 Their menu is quite extensive, with around 75 choices. As you can imagine, it was quite difficult to make a selection. Thus, you can ask for half a pizza. We didn’t realize this until after we’d ordered, but if you want to try several pizzas, I’d definitely get the half pizza option! For our first pizza, we ordered the Carré Phillips as our first pizza, packed with capicollo, pepperoni, hot italian sausage, ham, mushrooms, mozzarella, and green peppers. This is essentially what one would taste when they think about pizzas. Lots of meat and sausage flavour with a dash of green pepper and mushroom. 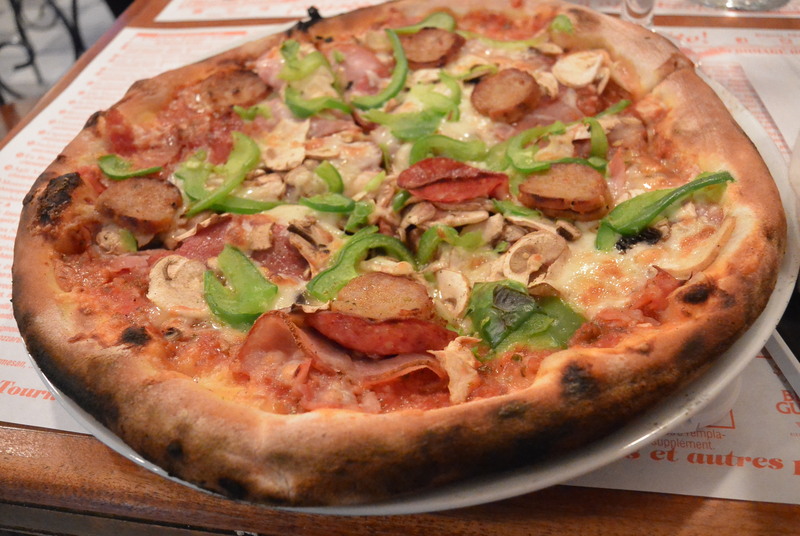 It’s an all-round pizza that I really enjoyed. The crust was thin, slightly crispy but not tough. The middle of the pizza never got soggy or wet and the slight burnt taste makes each bite a little more interesting. For our next pizza, we had the Tarfuto. 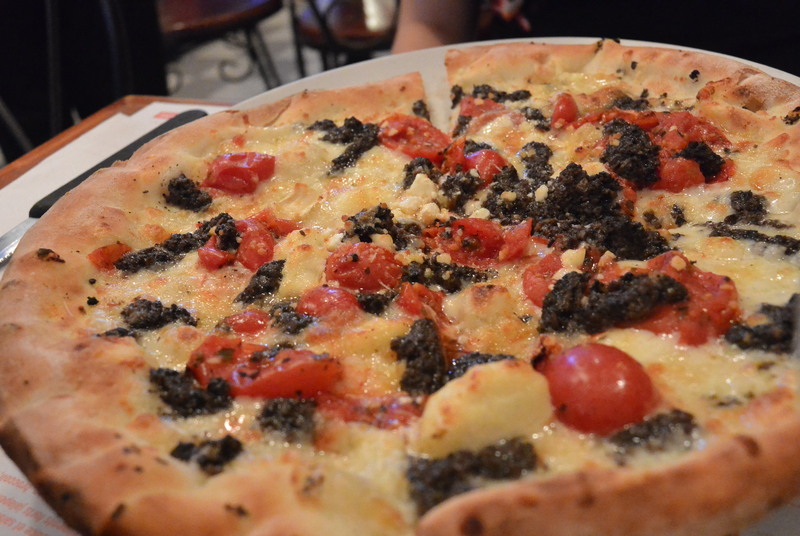 Mozzarella, goat cheese, black truffles and cherry tomatoes. The truffle was very fragrant and as soon as the pizza was nearing our table, we could smell the richness. Paired with the goat cheese and the tanginess and sweetness of the cherry tomatoes, the dish worked perfectly in harmony. The goat cheese and truffle boosted each other up in richness and fragrance, while the cherry tomatoes brought a tart kick to balance out the other two ingredients. A genius combination. Overall, I thought the food was phenomenal, the price was very reasonable and the service was so-so. I can’t say the service was bad, but we did wait over 20 minutes to get the bill. It was a busy night as it was grand-prix weekend in Montreal, but I still feel that a little more attention could have been paid. Either way, I definitely do recommend this very successful pizza joint (having been opened for 25 years), and challenge you to try all their combinations!